Today was a busy day for our family. I took our three year old boy to gym class, my husband was on baby duty, then I took both kids to a wonderful holiday/charity party at a friend's house. The concept was genius. Friends getting together to celebrate the start of the holiday season but the giving was entirely to those in need. All the guests brought gently used clothes and toys to the party. Our gracious hosts are then going to bring the collection to a women's shelter for us. It was very fulfilling and a great way to give back to the community. We get so wrapped up in our holiday shopping that we (and I) often forget how many people have very little or nothing. Laurie and Yaniv, if you are reading this, thank you again for allowing us to be a part of today! Hope this will inspire others to do the same. Being out all day, there was no time to make dinner tonight. I like to call this a "must-goes" night; a term my husband's grandmother used back in the day. You basically open the fridge and look for things that MUST GO...and that's dinner. The kids had spaghetti and meatballs, hubby had meat loaf and I gladly had more Israeli couscous with shrimp. Everyone was happy and the fridge got cleaned out. So there will be no talk of cooking in today's blog but I do want to tell you about my latest kitchen tool obsession. It's the Cuisipro Herb Keeper. I love keeping fresh herbs around for cooking but was starting to feel like I was just throwing money in the trash. The problem was their shelf life was short in the refrigerator and I couldn't seem to keep them alive in the garden either. They would usually wilt or rot before I even used them, which really adds up over time. I recently purchased this herb keeper for $20. You suspend the herbs in a couple inches of water and it keeps them fresh and crisp for a week or longer. It will be paying for itself soon with all the herb lives it's saving. I've used up all my herbs since its arrival, not a stalk has been tossed away. Honest! Sometimes it's the little things in life. 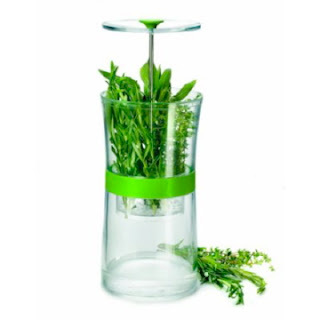 -Lid easily lifts to add water, slots in tray hold herb stems to stay hydrated while keeping leaves above the water. I need that herb keeper! Where did you get it?